Only one hope left for North American League of Legends fans. After being given the “group of life” for the League of Legends World Championships, Team SoloMid was knocked out of group D in a tiebreaker last night. To rub a little salt in the wound, it was European team Misfits that took the win over TSM. The EU vs. NA rivalry has been fervent for years, with Rift Rivals stoking the flames earlier in the season. But reactions to TSM failing to beat both a World Elite squad on some serious momentum as well as Misfits were strong. And these reactions are valid. 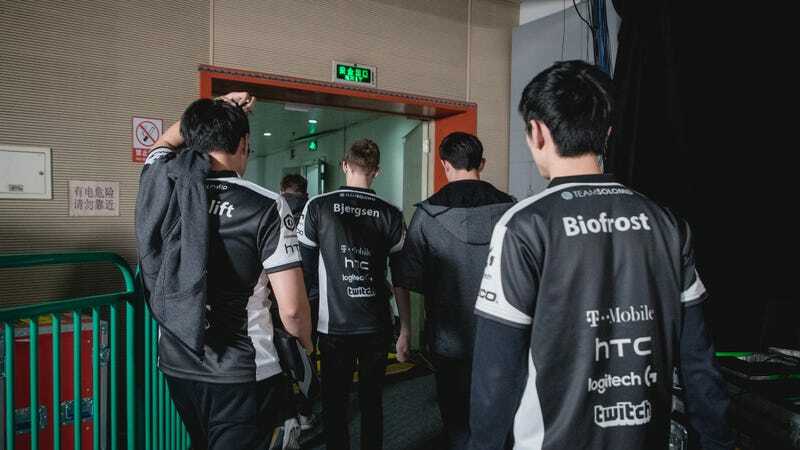 This is the third year in a row Team SoloMid has fallen short of the mark at the world championships, and it was frustrating to see conservative, safe play while a Cho’Gath farmed away in top lane. Small mechanical mistakes, using spells like Flash at the wrong time, or just a lack of aggression let Misfits take the steering wheel and force TSM into a corner. In a post-game interview with Travis Gafford, TSM founder and owner Andy “Reginald” Dinh, commented on the reasons why the team failed to make it out of the group. Immortals, another North American squad, also failed to make it out of groups earlier in the week. One last hope remains for North America in Cloud9, who will fight to be the sole survivor for NA later tonight against Edward Gaming, ahq e-Sports Club, and SKT T1.